The Boundless Thicket: Oxidatively Stressed Out! As a student who is majoring in Human Nutrition, I am always begging my family to eat healthier. We have a history of cardiovascular disease and my father is the worst offender of them all. He recently turned 50 years old, has hypertension, and is overweight so he is at great risk for developing cardiovascular disease. The other day, I was sitting in class listening to a lecture on one of the antioxidant vitamins, vitamin E. My professor explained that vitamin E might help prevent cardiovascular disease and cancer. In that instant many questions began to formulate in my head. What is so similar between cardiovascular disease and cancer that vitamin E is thought to prevent both? Of all the vitamins why vitamin E? What is the data that supports this claim? Can vitamin E supplements help my dad prevent the onset of cardiovascular disease? Naturally I had to do some research to find out all these questions that were left unanswered. I started searching through many databases such as Academic Search Premiere (EBSCO), Infotrac, and Pubmed. After searching through said databases, I couldn’t find the information that I needed. 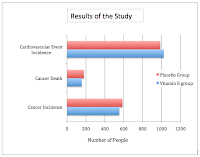 I decided to try Google Scholar, as a last ditch effort, and low and behold I found a perfect article from the Journal of American Medical Association entitled, “Effects of Long-term Vitamin E Supplementation on Cardiovascular Events and Cancer” by Eva Lonn, MD et. al. I began to read the article and knew that this was the answer to all my questions, but I also knew I needed to do more research to fully understand the information this article was giving me. So I looked up two more articles entitled, “Free Radicals in Cardiovascular Disease” by Jasmina Mimić-Oka et. al. and an article called, “Oxidative Stress and Cell Signalling: Involvement in Cancer Development” by Joël Pincemail et. al. After gathering all my information I had high hopes that this was another piece of information that I would be able to lecture my family on especially my dad to prevent them from suffering from cardiovascular disease and possibly cancer as well. First, I wanted to see the similarities between cardiovascular disease and cancer to better understand how vitamin E can beneficial to both. It turns out the mechanism by which both come about is very similar, because both diseases involve free radicals. Free radicals are compounds that have an un-even number of electrons so they are very unstable. 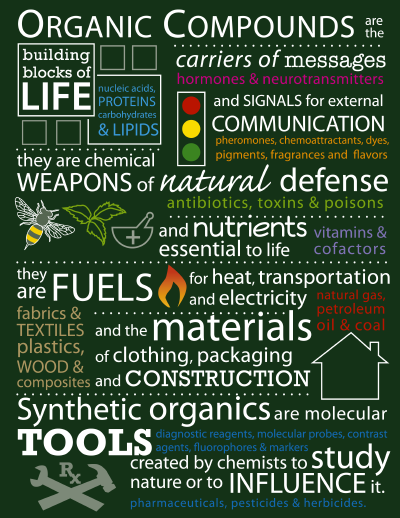 The body naturally produces free radicals through metabolism and also the immune system’s cells can purposefully create free radicals in order to protect the body from pathogens. Once a free radical is created they will try to react with compounds that are near to acquire the correct amount of electrons. This action can start a chain reaction that propagates even more radical species, creating high oxidative stress on the body. Ultraviolet light and toxins (pollution, tobacco smoke, other chemicals found in food, etc.) can also produce free radicals in the body. Every cell in the body produces free radicals; however, excessive free radicals are what cause problems in the body. Oxidative stress on the body plays an important role in cardiovascular disease especially in the development of atherosclerosis. Low-density lipoprotein (LDL) is crucial element in the free radical explanation of atherosclerosis. The process starts with the perioxidation of long-chain fatty acids (LCFA) by any radical (ex. Hydroxyl radical). These long-chain fatty acids are within an LDL molecule, and like as mentioned before a chain reaction occurs. Once one of the LCFA is oxidatively modified it gives rise to dienes and lipid hydroperoxy radicals. This self-propagating process continues and will attack other LCFA until the entire chain is fragmented. 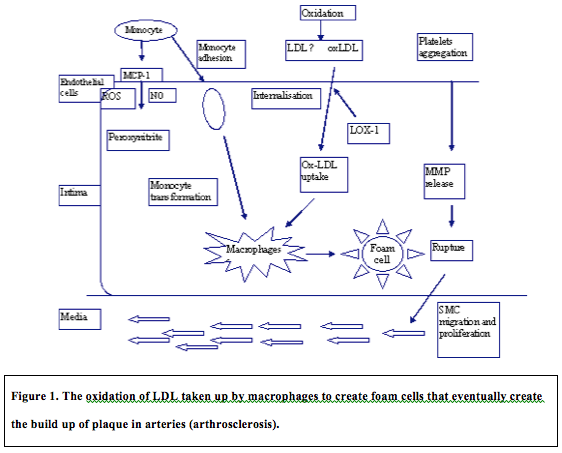 The oxidized LDL (OxLDL) is ingested by macrophages. The macrophages now become “foam cells” in the arterial intima. This starts another chain reaction where more and more macrophages become foam cells. 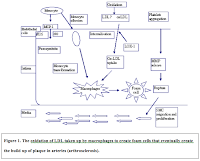 After this process, there is an accumulation of the foam cells (LDL ridden macrophages) that lay beneath the arterial endothelium. They form a “fatty streak” that starts the foundation for the development of plaque. OxLDL can also arouse the release of TNF-alpha and IL-1beta, which cause smooth muscles to proliferate. Collagen and elastin are produced to repair the smooth muscle, but instead they create plaque and fibrosis. Free radicals can also be involved with the development of cancer. There are three stages in cancer development: initiation, promotion, and progression. The stage of progression involves uncontrolled growth of cells because the organism is not able to recognize that these cells are a threat. At physiological conditions free radicals control the expression of factor AP-1. Ap-1 regulates cell growth mediators. If free radicals are produced in excess so is AP-1. This means that the cells will abnormally proliferate and can cause cancer. Cell apoptosis, programmed cell death, is regulated by many different proteins. In this case, the protein that we are concerned with in regulating apoptosis is protein p53. 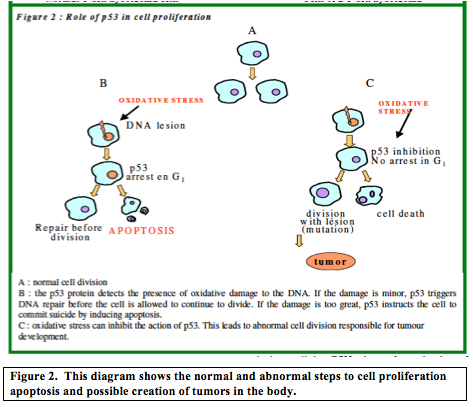 When there is an excess amount of AP-1 and the cell is abnormally proliferating or there is oxidative damage on the DNA, p53 activates cell apoptosis. In normal conditions cell apoptosis will begin and the cells are destroyed. 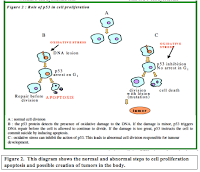 When there are too many free radicals the process to initiate cell apoptosis will not work because p53 will be inhibited, thus causing continued proliferation and cancer development. I realized that free radicals can cause cardiovascular disease and cancer, but why is vitamin E the antioxidant that might be able to prevent these two diseases? This is where my nutritional biochemistry class comes in handy. I looked through my class notes and found some pertinent information. The most active form of vitamin E in humans is called alpha-tocopherol. It is a major antioxidant that inhibits LDL oxidation. 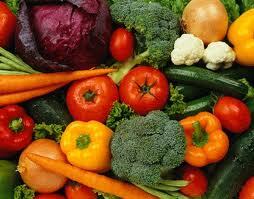 Antioxidants have the ability to neutralize free radicals in the body. They can help prevent cell or DNA damage. Since vitamin E is a natural antioxidant it seems like it is the perfect supplement to prevent the two leading causes of death: cardiovascular disease and cancer. and 20.6% of the placebo group had some type of event. After reading this article I was a little disappointed. I thought that I was going to be able to share more information with my family and my dad in order to prevent cardiovascular disease. There are also many questions that come to mind after reading this article. One question is on the dose size of vitamin E supplements. They study said the patients were given 400IU/day. I did the conversion and that is about .268mg/day of extra alpha-tocopherol that is in the body. The RDA for adults in the age group of 55 years old is 15mg/day. The dosage was not that much higher and the upper limit for adults is 1000mg/day so I wondered if the dosage was higher, would there be a different result? I also wondered if the treatment was with natural occurring vitamin E in foods rather than in supplemental form would there be different results? After researching this topic I learned many interesting facts about how free radicals work in the body and how the body tries to maintain the amount of free radicals so they aren’t in excess. Rather than supplementing the body with more antioxidants the best option is to limit your self from oxidative stress. Obviously you cannot tell your body to stop metabolizing radicals, but you can stay away from cigarette smoke, areas that have high pollutants in the air, and stay away from harmful chemicals in food. While researching I found a lot of information on other antioxidants and how they help reduce oxidative stress in the body as well. Fruits and vegetables are filled with antioxidants so the next time I talk to my mom I have to thank her for making me eat all my fruits and vegetables when I was younger! 1. Joel, Pincelmail. "Oxidative Stress and Cell Signalling: Involvement in Cancer Development." Google Scholar. Web. 23 Feb. 2012. <http://www.probiox.com/uk/html/documents/OSandCellSignaling.PDF>. 2. Lonn, Eva, Bosch Jackie, and Yusuf Salim. "Effects of Long-term Vitamin E Supplementation on Cardiovascular Events and Cancer." UK PubMed Central. Google Scholar, 16 Mar. 2005. Web. 23 Feb. 2012. <http://http://ukpmc.ac.uk/abstract/MED/15769967/reload=0;jsessionid=TAUweP7669qwoaa8LCZU.114>. 3. Mimic-Oka, Jasmin. "Free Radicals in Cardiovascular Disease." FACTA 6.1 (1999): 11-22. Google Scholar. Web. 23 Feb. 2012. <http://ni.ac.yu/Facta>. Great article! You found some really interesting, long-term studies, and although the claims of vitamin E preventing cardiovascular disease and strokes were not proven in the end, there definitely seems to be some solid science background in what occurs at the molecular level with these antioxidants. I am curious though, how do free radicals produced by the immune system combat pathogens? Why would the body purposely produce them? Also, what is the mechanism behind antioxidants' ability to neutralize free radicals in the body? A quick explanation would be helpful. Great paper, overall. It flowed very nicely with your thoughts and motives, and it is clear that you had a genuine interest in what you were researching! Great post! Although I am a biology major and have learned a lot about free radicals and the cellular events that lead to diseases such as cardiovascular disease and cancer, I had no idea they were related. I agree with you that this article had a lot of potential and somewhat disappointing results. You make a great point about the dosage used in the study, and I think that would be an excellent way to further test the hypothesis of vitamin E preventing such diseases. Your ending paragraph reminds me of the article I researched on the effects of fruit on stroke prevention in women. The study I looked at found that flavanones, which are antioxidants commonly found in citrus fruits such as oranges, are somewhat beneficial in preventing strokes. I think these two concepts are closely related and if I learned anything from doing my research and reading your article, its that antioxidants may be great ways to prevent disease.